Put Option is the right to sell while Call Option is the right to buy. So if you are trading put options on stocks, it means you are trading the rights to sell the stocks on a certain day for a certain price. The basics are the same as call options except for the "buying" part replaced by "selling". The above example of a put option shows the right to sell certain stocks for $10 on October 1. $0.5 premium means that the option itself is trading for $0.5, right? Correct. Just replace "the right to buy" with "the right to sell" in the previous lesson, and we are almost done. Let's see how traders buy and sell a put option. Suppose that the stock is trading at $11.0 on September 1 when the put is traded. A buyer of the put pays $0.5 for the premium of the option. A Seller of the put receives $0.5 for the premium of the option. 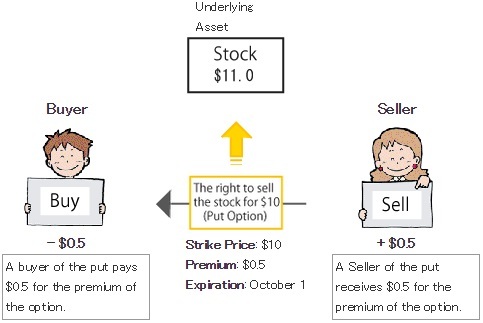 In this example, the buyer pays the seller $0.5 for the premium of the put. The expiration date of the option is October 1, just one month after the trade. The buyer now has "the right to sell the stock for $10 on October 1", doesn't he? Yes, he does. And just like a call option, the buyer has the right while the seller has the obligation. A put option gives the buyer the right, but not the obligation, to sell an underlying asset at the strike price. The seller of a put option has the obligation to buy an underlying asset at the strike price when the buyer exercises the option. Again, the difference from a call option is a "buy or sell" part. Of course, sellers can buy back the options they have sold to become free of the obligation, and buyers can resell options to realize profits before the expiration. Rights for buyers, obligations for sellers. I remember. Now let's see what happens one month after the trade. The buyer wins and the seller loses if the stock price falls below $9.5. The seller wins and the buyer loses if the stock price stays above $9.5. 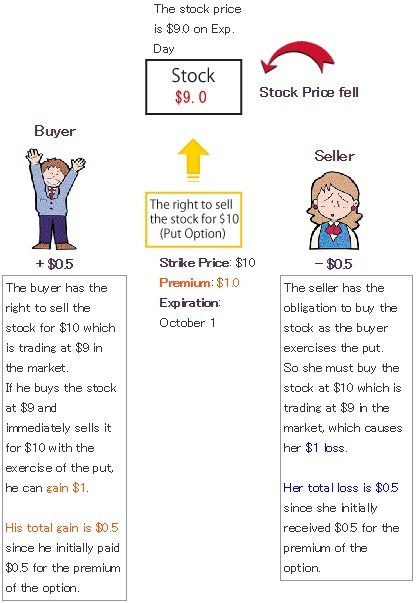 The buyer has the right to sell the stock for $10 which is trading at $9 in the market. If he buys the stock at $9 and immediately sells it for $10 with the exercise of the put, he can gain $1. His total gain is $0.5 since he initially paid $0.5 for the premium of the option. The seller has the obligation to buy the stock as the buyer exercises the put. So she must buy the stock at $10 which is trading at $9 in the market, which causes her $1 loss. Her total loss is $0.5 since she initially received $0.5 for the premium of the option. In the real stock market, 1 put option contract gives you the right to sell 100 shares of stock. Similarly, the total loss of the seller would be $50 in the real market. As you can see, the buyer of the put wins and the seller loses if the price of the stock (underlying asset) falls sufficiently by the expiration day, which is just the opposite of a call option. Next, let's take a look at the case where the stock price didn't fall. The put option has no value at this point because no one wants to sell the stock for $10 which is trading at $11 in the market. His total loss is $0.5 since he initially paid $0.5 for the premium of the option. The seller doesn't have to do anything because the put option has expired worthless. Her total gain is $0.5 since she initially received $0.5 for the premium of the put. In this case, the buyer of the put has "the right to sell the stock for $10", but the stock price didn't changed from $11 since the option was initially traded. No one bothers to sell the stock for $10 with the exercise of the put if he can sell it for $11 in the market. The buyer doesn't have to exercise the option, does he? Right. When there is no benefit in exercising the put, the buyer can just let it expire worthless. As a result, the seller doesn't have to do anything with the put, finishing the trade with $0.5 profit. In the above example, $9.5 (for the stock price) is the break-even point on the expiration day for both the buyer and the seller of the put . Let's take a look at the profit/loss graphs. The buyer's loss is limited to the initial premium, but a profit can be large if the stock price plummets before the expiration, right? The above graphs look symmetrical to those of call options. You're right. Just like call options, buyers of put options have unlimited profit potential and limited loss potential. Be aware, however, that the stock price can never fall below zero. So actually the profit potential for buyers is not unlimited, which is a difference from call options. Having said that, it is practically safe to remember that buyers of put options have unlimited profit potential since the profit potential is much larger than the limited loss. The seller's graph also looks similar to that of call options'. The profit is limited to the option premium, but the loss gets bigger and bigger as the stock price falls. Just the opposite of the buyer. 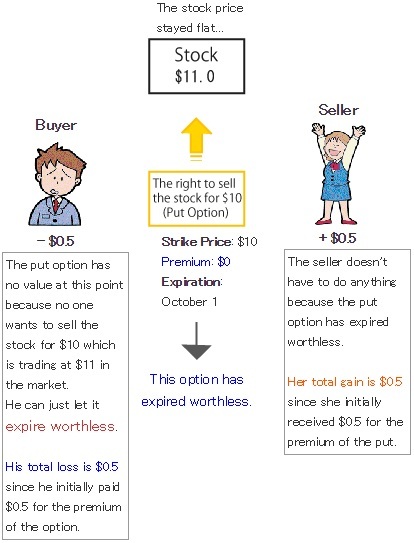 Sellers of put options have limited profit potential and (practically) unlimited loss potential. Sellers of puts have a greater chance of winning than buyers, like sellers of calls. In the above example, the seller can gain a profit if the stock price rises or stays flat. In addition to that, she can make a profit even when the stock price falls as long as it doesn't fall below $9.5. Sellers should be vigilant because they are sometimes faced with a huge risk in the case of big events such as market crashes. Buyers have a less chance of winning but occasionally make a fortune with a big swing in the price of the underlying asset. They certainly do, as what we learned in Call Option. Keep in mind that the P/L graphs for put options are symmetrical to those for call options, and you will be fine. That's it for the 4 basic trades of options: buying and selling calls, and buying and selling puts. At this point, you have learned 70% of the option basics. Congratulations!! Really? It wasn't as hard as I thought it would be! Those P/L graphs are important but a little confusing at first, so we will recap in the next lesson what we have learned so far.